Morehead City recently dedicated a new water treatment plant featuring Tonka Ion Exchange for softening, color and TOC reduction. Interested citizens, community leaders and medical professionals attended the open house. The City was pleased to add this improvement to one of their most essential citizen services – an abundant, appealing, and healthful drinking water supply. Morehead City’s water supply comes from groundwater wells and contains minerals that create a hard scale in the pipelines. It also contains naturally occurring color that is noticeable in bathtubs, pools, and in drinking cups. 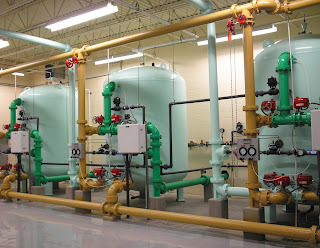 For treatment of the hardness and color, Tonka provided three ion exchange vessels using solar salt to produce softened water, and three ion exchange vessels to decolorize the water and remove materials that had the potential to form disinfection byproducts. The facility was designed by McDavid Associates of Farmville, NC. The positive effect on the community was almost immediate. The local hospital noticed that the cost of assuring high purity water for their instruments and treatment practices dropped in half. Local residents voiced their pleasure about having soft decolorized water. The difference between the well water and the finished water was remarkable. During the peak tourist season, the water plant produces 1,200,000 gallons per day of softened, decolorized water. The Tonka ion exchange system achieves the water quality required by the City of Morehead with a cost-effective, environmentally sound solution.